Your favourite marsupial, Crash Bandicoot, is back! He’s enhanced, entranced and ready-to-dance with the N. Sane Trilogy game collection. Now you can experience Crash Bandicoot like never before in Fur-K. 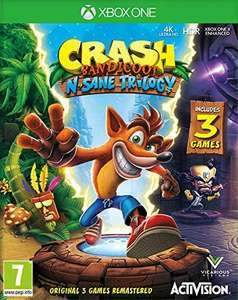 Spin, jump, wump and repeat as you take on the epic challenges and adventures through the three games that started it all, Crash Bandicoot, Crash Bandicoot 2: Cortex Strikes Back and Crash Bandicoot: Warped. Relive all your favourite Crash moments in their fully-remastered HD graphical glory and get ready to put some UMPH in your wump. £18.99 @ Smyths if it's convenient to anyone. Also £17.50 with Xbox Live Gold in the Spring Sale if you prefer digital. Always thought that this is PlayStation exclusive title. Heat from me! It's on the Switch too.